Belle was born and raised in Laredo, TX and moved to San Antonio early 2017 when she bought her first house at 23 years old. 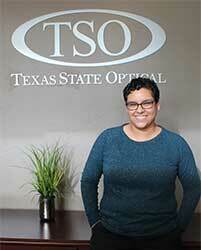 She has been with Texas State Optical for 3+ years and is an expert at multitasking and providing excellent customer care to our patients. I was completely satisfied with everything about this visit. I was late for my appointment, so I hope I didn't disrupt the schedule...but everything about my visit was excellent! Dr. Dunlap was very pleasant and helpful. I appreciated everyone's guidance." I am a repeat customer and have had consistently good service every time I visited the office. Dr. Dunlap is very thorough and makes sure that you get a good fit for your contact lenses. The glasses seem to be a bit expensive but I have a very strong prescription so that is to be expected. Went to the office last week and the experience was great. The staff and the doctor were friendly and attentive. Genuinely nice staff from the receptionist to the doctor. Contacts ordered came in within three days of eye exam and glasses took about the same time. Doctor Dunlap has a great memory, approachable manner and drive to make sure your prescription is correct! Linda goes above and beyond for glasses style and fitting selection (even set up a private meeting with the distributor from Diesel for me to find the perfect pair). The wait time for appointments is spot on with no delay the multiple times I was in. Thank you!